Christmas is coming! What sort of art-related gifts do we suggest? 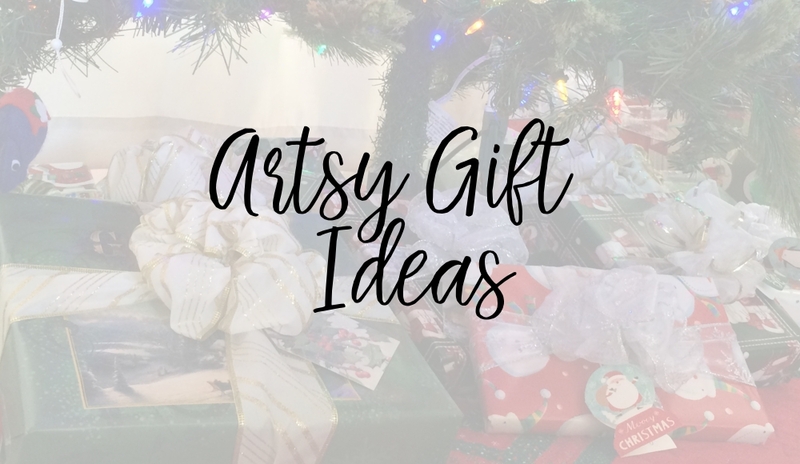 Deanna and I mentioned a few of our favorite gift ideas in the Podcast episode #36, but here we’ve compiled a list of all our favorite artsy things and sorted them into some different categories. I try to use affiliate links whenever possible. So, if you use one of these links I may get a few pennies from it. However, the cost to you will be the same. I promise that I never choose what to suggest to you based on the benefit I might receive from it! You can learn more about our affiliate policy here. Please keep in mind that many of these items are also sold at Michaels and Hobby Lobby, where they almost always have some kind of coupon in their app! These are the sort of art supplies I buy my own elementary aged children. 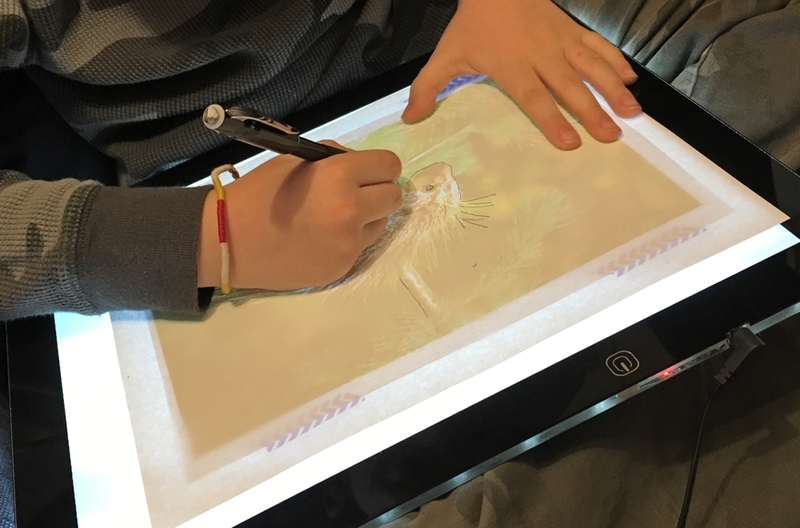 Light Pad– Dbmier Light Box/Pad $39.99- This is one of my favorite things for both younger and more advanced students so I’m including it in both lists! It’s easy to use, lightweight and has held up to a year of being hauled around in my kids’ backpacks! Two fun add-ons to a nice color pencil set are a Prismacolor sharpener (with two pencil shapes) and a blending pencil (a colorless pencil). How to Draw Books by Peggy Dean– these are mostly plants and flowers. I love her super simple approach and the large volume of drawings in each book. Botanical Line Drawing is a great starter book to help you learn to draw simple plants and nature. Learn to Draw books published by Walter Foster. We own this one on drawing people in ancient times and I love that they start their step-by-step drawings with ball and stick figures. Their other books also look nicely done and they’re very inexpensive. When I’m looking at a directed drawing book (where they lay out how to draw an image step by step) I generally look for the steps to start with basic overall shapes (as opposed to one where they show all the detail for one part, like a head, prior to giving the rest of the subject any shape). I also look at the last steps and analyze how much. Search “How to Draw” on Amazon and at your local library! Watercolor Pencils– Fabber Castel Albrecht Durer ($38 for a 24 pack) – These are also sold in different sized packs, so buy what your budget allows. Travel Paint Palette- Deanna and I both have these Mijello Martin Airtight Watercolor 18-Well Palettes. Then come empty, so plan on purchasing some watercolor tubes of paint to fill them up! Deanna talked about this in the podcast #36 (timestamp: 49:40)! Pens for Pen and Ink drawings-Sakura Pigma pens seem to be the standard pens for the “pen and ink” medium. I’ve used them for years and really love the variation in tip size. This is a nice starter set, but the most common 01 size is also available individually. They also come in a variety of colors. They dry very fast so they’re less likely to smear than any other pens I own, so I also use them when underlining in books with glossy pages. They don’t tend to bleed through to the back of the paper so I can do a lot of practice drawing on the standard 24lb printer paper mentioned above (although they do still tend to show through thin bible pages- do any pens not show through?). This pack of 6 Sakura Pigma Micron pens is a nice starter set for $11, but lacks the larger tips. Woodburner: This Wall Lenk woodworker tool set ($29) includes 7 woodburning tips and my boys LOVE it. (Do ALL boys love burning stuff as an art form?) I’ve really enjoyed using it as well! (I’ve posted some photos on Instagram and our facebook group.) It’s a lot nicer than the one I used at the kids’ summer camp, but still very affordable. Nature Journalling Book: Laws Guide to Nature Journaling– this is one of my favorite overall art books. He has some more advanced techniques and some great step-by-step drawing guides (aka. directed drawing). Plus, it’s just beautiful. It’s a little pricey but ohhhh, I love this book! Drawing Flowers Book: If you want to learn to draw florals, Alli Koch is one of my favorite authors. My sister bought me her How to Draw Modern Florals book in 2017 and I still use it pretty frequently. (The gold spiral binding is especially handy and beautiful!) In this book, Koch broke down so many flowers to their basic lines. It makes drawing flowers sooo much faster and easier. Koch has another book coming out Dec 4th called Florals by Hand! I’m really hoping Santa will have it wrapped under the tree for me!! Watercolor Paper- Watercolor paper is usually made with a high cotton content to allow it to absorb water without buckling. So. having some nice paper will make painting with watercolor much less frustrating. The paper you use will become personal preference and it can be a fun splurge item to try some new paper. I recommend going to your local art store (NOT Michaels or Hobby Lobby) and ask them if they have any sample packs of paper you can try. DickBlick.com also has a wide selection of paper. Strathmore 300 series 140LB Cold Press Paper- ($10.49 for 24 sheets 9″x12″) This year I made a point to try several different brands of paper and I’ve decided that I like Strathmore 300 series best. It feels like the best balance between price and quality. Strathmore 400 Series Visual Watercolor Journal, 140 LB Cold Press. ($7.50 for 22 sheets 5.5″x8″, spiral bound) Deanna has really been enjoying this smaller book of watercolor paper for her painting experiments. Travel Journal Sketch Book- I love Canson’s 138 lb Mix Media Paper Pad (Fine to Medium texture). This wire-bound pack of 30 sheets of 5.5 x 8.5 Inch paper is exactly what I’ve been traveling with this year. If I decide to add a bit of color with my watercolor pencils, it can still handle it (where the 24lb printer paper could not). However, it’s easier to sketch in than watercolor paper because it’s smoother. We’d love to hear your suggestions too! What artsy gifts do you suggest?